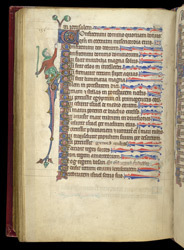 Heraldry on the first page of the Psalms text strongly suggests that this Psalter was commissioned by King Edward I for the marriage of his son Alphonso, to Margaret, daughter of Florent V, Count of Holland, which was to take place in 1284. Alphonso died before the wedding, however, and the decoration of the manuscript was left incomplete. Additions were made in the early 14th century, probably before 1316. About twenty to thirty years after Alphonso's death, a later owner had the decoration completed in the style of the day. Although the general decorative repertoire of the earlier and later parts are similar--including figures such as the hybrid human-animal creature here--there is a great difference in quality.